After a weekend getting acclimated to Rabat, Monday was a day for interviews for everyone. For some, the day began early, rising for early morning meetings around the city, and for others, there was some time to prepare the final list of questions. I was a member of the former group, as the four people studying migration had a morning interview at the University of Mohammed V, Agdal campus, which was on the opposite side of the city. After a quick breakfast and espresso at Toscane, a café next door to the hotel, we hailed a taxi, which was no small feat. After finally flagging down a taxi with four empty seats, we immediately required Connor’s Arabic skills to explain where we needed to go, as well as how much we were willing to pay. Then, when we reached the university, my French was needed to locate professor Mohamed Khachani’s office. The professor is an expert in all things related to Moroccan migration and he heads the Moroccan Association for the Study and Research of Migration (AMERM). But, the interview could not have happened without another language skill: Sara’s Spanish. It was a completely multicultural and multilingual experience, and the wealth of information conveyed by Mr. Khachani in multiple languages was staggering. He offered new, insightful perspectives on migration policy through post- and neo-colonial lenses. He also gave us four of his books to take back with us for further study and investigation. After the first interview, all four members of my group hopped on the brand-new tramway system, which feels more modern than the T or New York subway. It whisked us back toward the Medina, where we grabbed a quick lunch before reaching the Center for Cross Cultural Learning (CCCL). First of all, the CCCL’s building was a beautifully decorated, tiled riad, a traditional home of an aristocratic family. 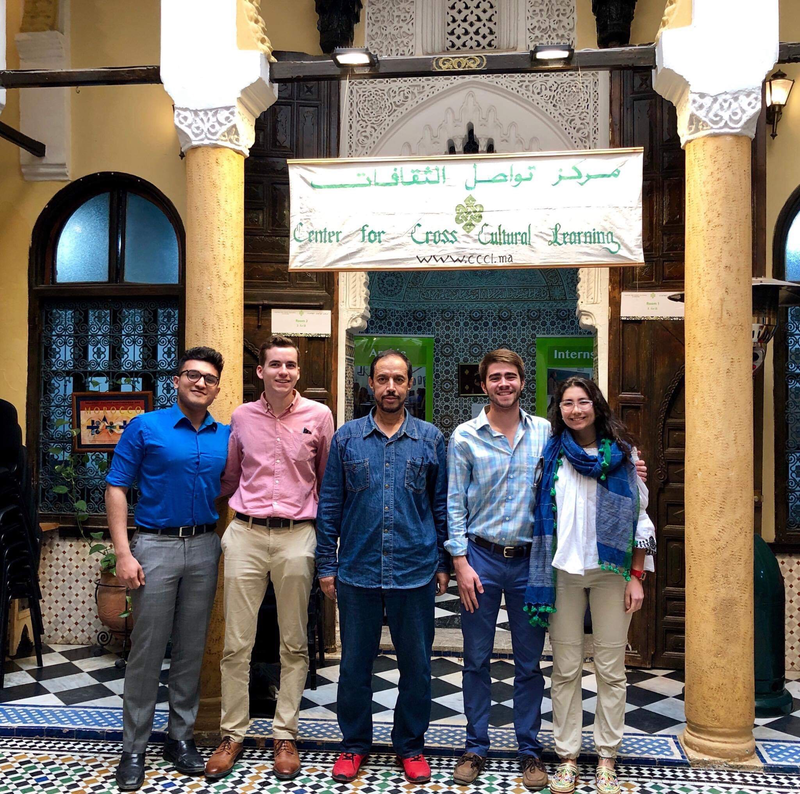 The CCCL runs study abroad programs aimed at multicultural understanding, including one program specifically focusing on Moroccan migration. Professor Et-tibari Bouasla, the director of this program, spoke with us for almost two hours, offering another incredible perspective on migration in Morocco. Professor Bousala holds a PhD in sociology from the University of Anglia’s School of Development Studies and a doctorate in anthropology from Paris-Sorbonne University. He has done extensive field research in migration and local development, identity, and integration of Moroccan immigrants in Europe; worked as an expert on migration with the Royal Institute for Strategic Studies; helped develop Morocco’s National Strategy on Migration and Asylum; and served as a youth expert for a USAID-funded program for marginalized youth in northern Morocco. Et-Tibari is connected to an extensive network of Moroccan NGOs involved in local development projects, migration, and social development. He has taught sociology and anthropology at University Mohammed V, Rabat, Morocco and abroad and was a member of the scientific committee of the International Review of Sociology (1991–2004). These two interviews were among numerous interviews conducted by the group today, including the former director of the Rabat Villa des Artes and an international relations researcher in a think tank run by the monarchical government. After watching the sunset at the beach, we came back to the hotel to plan for another busy day tomorrow!